I have learned over time that you can make marmalade out of any citrus fruit. Jan had asked me to buy some mandarin oranges, but she was having trouble peeling them with her broken arm. I decided that I needed to use them up before they spoiled. My wife, Jan, went to Fresno to visit family and friends just before Christmas. One of her friends orange bombed me with 40 perfectly ripe, 3 inch navel oranges—enough to make almost 20 jars of marmalade. I have already made and given away this year’s Christmas batch. What could I do to use them up without them just sitting on my shelf? I have a few recipes that I make again and again. However, my penchant for never making the same recipe the same way twice means that they have morphed since I posted them years ago. My Christmas marmalade is one such recipe. I have been making marmalade the same way for years for a Christmas giveaway. I bought a microplane zester that produced very fine bits of rind. Over time I have been experimenting with the recipe— no extra water, fine bits of zest and less and less sugar. This has produced an intensely flavorful marmalade. One of Jan’s friends has a sweet lime tree. She gave Jan 6 limes from her current crop. I decided that a small batch of marmalade was the best way to preserve this bounty. I have learned over time that you can make marmalade out of any citrus fruit. Every Christmas for more than the last decade I have made marmalade as a giveaway. A few years ago, I bought a microplane zester that produced very fine bits of rind. I also stopped using any extra water, just the zest and juice of the oranges. 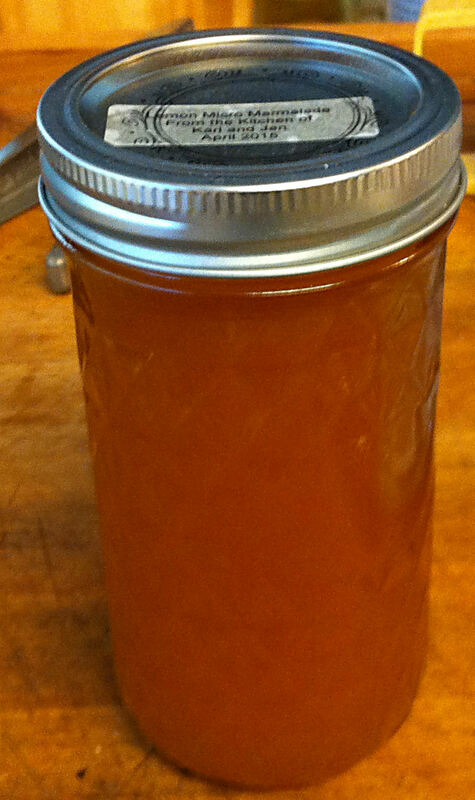 This micro marmalade was an intense flavorful jam, but it did not make as much as the old way I had been using. This year I ended up giving away all of the marmalade I produced and we had none left for ourselves. Every Christmas for more than the last decade I have made marmalade as a giveaway. a few years ago I started making special batches of intense jams that contained only the zest and juice of the oranges. Last weekend I was lemon bombed and I wondered if I could make a marmalade of just lemons.